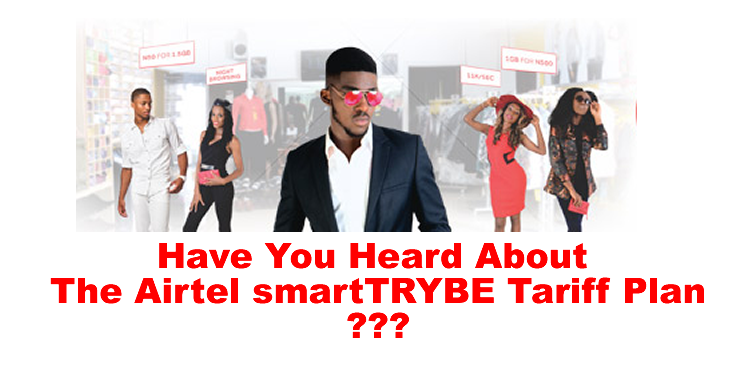 Have You Heard About The Airtel smartTRYBE Tariff Plan? To be able to buy 1GB worth of data for just 500 Naira which you can use anytime of the day. To be able to do get 1.5GB worth of data for you to browse between 12am and 5:00am for just 50 Naira. How does this benefits sound, cool right? Yes it is. And many of us who are in the Airtel Network are rocking it. The Airtel smartTRTBE tariff plan is a special plan which Airtel design to keep us connected. So with the high speed internet connection which is guarantee when you are in the Airtel network coupled with these low price of overwhelming volume of data and the cheapest call rate ever, we are absolutely sure that you will never miss a thing that is happening with family member, friend and other things around Nija and the World. To migrate to the Airtel smartTRYBE traiff plan, just dail *312# and you are in. And do you know what? Migration is free!!! if this is the first migrating you are doing in this month. But before you migrate, please read this carefully. True, calls to all local networks is charged at 11kobo per seconds, but this is after you have made a 50seconds call for that day which is charged at 20kobo per seconds. But it is not compulsory that you make the 50seconds call at a go, it call me multiple calls, and also if in the first call you spend more than 50senconds (let say you make a call that is 1minute and some seconds) Airtel will only charge you 20kobo per seconds for the first 50seconds in that call will the remaining will be charged at 11kobo per seconds. More also, you will be given Free 15MB to browse in week if you recharge at least 200 Naira in that week, and it is not a must that you have to recharge 200 Naira once, you can do it twice (i.e. 100 Naira recharge twice) in that week. Know that the Week we are talking about start counting from the day and time of your first recharge and not from Monday or Sunday. Note also that at the first recharge of 100 Naira in a week you will be given 5MB it is after you have recharge the second 100 Naira in that same week that you will be given the remaining 10MB. Apart from the overwhelming data benefits of this smartTRYBE tariff plan from Airtel, there are others, and you can access them all using the Unstructured Supplementary Service Data (USSD) menu of the smartTRYBE tariff plan which is *312#. Yes! it is the same code you will use to migrate, but the USSD menu will change when you have opt-in to the plan so that it can reflect all the other benefits you can enjoy. Also we will like to bring to your notice this fact. If you activate the night browsing bundle (either that of 500MB or 1.5GB) you will not be able to roll it over to the next night. This means that the Night browsing bundle are only valid till 4:49am (approximately 5 o'Clock in the morning), so any volume of data that you did not consume before then will be forfeited -but with so much things to download or watch online and browse, who cannot finish it when they mean to? Can you not finish it? Only prepaid Airtel customers are given the benefits of the smartTRYBE plan, and to enjoy the daily benefits such as the 11kobo per seconds call rate, you need to reached the daily threshold. You will not be able to share or gift the data bonus you are given when you recharge. And as mentioned earlier, migration to the smartTRYBE tariff plan is free if it is your first migration for that month. But if it is not, you will be charged 100 Naira. Since the Airtel smartTRYBE plan is only for prepaid Airtel customers, Postpaid, Airtel Dealers and Payphones customers of Airtel cannot migrate to the Airtel smartTRYBE plan, and thus cannot enjoy it's benefits. If you have anything other thing you will like to know about the Airtel smartTRYBE tariff plan or about any other network in Nigeria, please do not hesitate to ask us. It is our delight to help people and you are not excluded, so ask us.